CHANDIGARH, Dec 19  In order to streamline the functioning of the UT Licensing and Registration Authority of Motor Vehicles the administration will start the integrated on-line computerised service. CHANDIGARH: The Archer Centre for Student Leadership Development at Rensselaer Poltechnic Institute, Troy, New York, is offering students opportunities to enhance their leadership skills, says Ms Angela R. Tatum, a specialist in leadership studies. 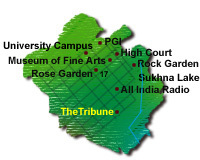 CHANDIGARH: The Botanical Garden of Panjab University has virtually been left out in the cold. Though the pathway has pots of chrysanthemums and beds of rose bushes on either side, further on there is no evidence of it being a botanical garden. CHANDIGARH, Dec 19  Eat less and live more, opined Prof BK Sharma, Director, PGI , while inaugurating the two-day Indo  US Continuing Medical Education programme organised by the alumni of Government Medical College, Patiala, at the IMTECH in Sector 39 here today. CHANDIGARH, Dec 19  The Union Government has already ordered the laying of the Chandigarh  Ludhiana rail line and the government is interested in getting on with the project as early as possible, claimed the local MP, Mr Satya Pal Jain. CHANDIGARH, Dec 19  The annual sports meet of Strawberry Fields School of the Durga Das Foundation, Sector 24, held today, was a thumping success. CHANDIGARH, Dec 19  With a view to having effective control over the functioning of IAS, IPS, PCS and HCS officers in the Union Territory, the Punjab Governor, who is also the Administrator of Chandigarh, has decided to become the accepting authority of their ACRs (annual confidential reports). CHANDIGARH, Dec 19  The Western Command Provost Unit celebrated its 37th raising day in Chandimandir today. CHANDIGARH, Dec 19  In order to streamline the functioning of the UT Licensing and Registration Authority of Motor Vehicles the administration will start the integrated on-line computerised service. Tenders for the same will be floated within a fortnight. The department has been a problematic one. During the past few years many public interest litigations were filed in various courts. Efforts to do away with the long delays and harassment to the public, which had been plaguing the authorities, would be tackled with the start of the service. The office of the branch was recently shifted from the municipal corporation building to the Estate Office as a step towards this end. According to sources, people will be able to get their transfer of vehicle documents the same day. It took months earlier. The entire procedure will be changed once the service starts. The reason is that the old practice of tallying the signatures of the seller of the vehicle will be done away with and all that the buyer will have to do for getting the registration transferred is to attach identity proof of the seller with the requisite forms. Meanwhile, after the office was shifted to its present location and some changes affected, more than 4000 licences have been given to people. Another novelty of the scheme will be that people will be issued plastic cards instead of the present laminated cards. As all the computers will be interconnected, work will be done at a faster pace. The files, complete in all aspects, will also no longer be sent to the registering authority for signatures of the official concerned as the computers will be programmed to append the signatures on the files. A lot of time will be saved by this process alone, sources say. Officers claim the licence which eluded people for more than 15 days will now be made available in just half an hour. After this has been done, a special drive to tackle the problem of computerising the record room of the branch will be undertaken so that the old cases can be tackled. All required information will be available in a matter of minutes. CHANDIGARH: The Archer Centre for Student Leadership Development at Rensselaer Poltechnic Institute, Troy, New York, is offering students at opportunities to enhance their leadership skills, including communication skills, teamwork, multiculturalism, values, ethics and self awareness, says Ms Angela R. Tatum, a specialist in leadership studies. Ms Tatum is here as a guest of Mr S.K. Bijlani, a top executive-turned- management consultant. "Top and middle level management people are now sent for specialised leadership training. But at Rensselaer, we educate the leaders of tomorrow for technologically based- careers. Leadership does not necessarily mean political leadership. Everybody can be a leader in his own way," she says. "The Archer Centre is collaborating with the faculty of schools of engineering and management to make student leadership and communications as a part of the curriculum. One credit course is offered to second year undergraduate students both at the School of Engineering and School of Management. Talking about the introduction of similar programmes at the high school level, she says the type of training done at Archer Centre is best suited for students of a professional course. Students at school level are perhaps not at that level compared to those who have opted for their careers in management or engineering. Reaction in conflict or breaking of communication are the areas where leadership training and communication becomes useful. Not only that this training is important and useful in values and ethical decision making, conflict management, leadership styles and in implementing change. A normal graduate in engineering or management may not possess these skills, she adds. The Archer Centre continuously gets calls and queries from other technical universities and institutions about how the contents of its course have been developed or how it is funded. Ms Tatum, is in this country to attend a wedding. Uprooted trees, weeds, wild creepers and congress grass now make this garden an apology of its previous self. There are either no boards giving the names of plants or they are completely rusted. Elsewhere, there are boards with plant names but no plants around. A huge pond lies choked with wild growth right in the centre of the garden for the past eight years. A gardener says, "There is nobody to take care of the plants anymore though the exotic species are continuing on their own. With the demise of Dr Mehra, the garden which is his baby, will follow suit if things continue the way they are." A team of 18 men has been assigned the task of looking after the garden. One employee alleges, "The official in charge of the garden and its upkeep walks in once in a while for the heck of it. He is clearly uninterested and disinterested." However, Prof SP Vij, Chairman of the Botany Department, who has also been entrusted with the garden's upkeep, denies all allegations and attributes the garden's condition to the paucity of funds. "We require a sum as huge as Rs 10 to 12 lakh as against the paltry sum of Rs 1 lakh assigned for the job. The sanctioned amount is used up in paying the extra men we need to employ from time to time. I'm sure you don't expect me to shell out money to maintain the garden." "I go there (to the garden) for two hours every morning, take a look around and assign work for the day. New plants are added while efforts to retrieve plant varieties which die each year are made," he claims. He, however, admitted that the garden was degenerating but maintained that he was not to blame for it. "The person appointed by me to look after the garden is on two months' leave due to family problems. The post of curator lies vacant. The university is the appointing authority and not the chairman, so I'm not to blame." When asked about the rotting trunk which has not been removed from the pit, he says, "I am aware of this and of the 18 different trees we have lost. Waterlogging, which prevents the roots from breathing, is the prime cause of the loss. I want experts to come and study the problem and suggest measures to counter this rising water level". About the weeds, he quips, "What are weeds for you might be of great importance for our study and we might have deliberately planted these. Furthermore, this is not an ornamental garden. If you are looking for manicured lawns, the rose garden is the place for you". While officials look on, the garden inches towards its death as burn marks, left by dried leaves set on fire, appear on the lawns. CHANDIGARH, Dec 19  Eat less and live more, opined Prof BK Sharma, Director, PGI , while inaugurating the two-day Indo  US Continuing Medical Education (CME) programme organised by the alumni of Government Medical College, Patiala, at the IMTECH in Sector 39 here today. Professor Sharma, who is an acclaimed doctor of medicine, was delivering a lecture on "stop ageing now". He said it was a proven fact that by consuming lesser number of calories a day person lived longer. Eating less, however, did not mean bad nourishment, he clarified. Listing out a host of things that need to be followed to prolong life, Professor Sharma said control over ones temper, regular exercise and a happy married life were among the several important factors, he said. Studies had shown that after the death of a spouse the death rate among the living spouses rose. He said smoking was big no, while alcohol in moderate quantities was found to be good for the health. Genetics would have big role to play in future, he added. Earlier in the morning, Dr Harry Sahota, a noted cardiologist from the USA, demonstrated techniques of tackling cardiac problems. Meanwhile, the CME got under way in the evening. Doctors who have passed out of Patiala Medical College, will be attending the CME. This was the first such conference to be organised. Mr Jain met the Union Railway Minister, Mr Nitish Kumar in New Delhi yesterday. Mr Jain requested him that either the Prime Minister or he himself should come to lay the foundation stone of the project in January or February. The minister said that he would draw a programme after consulting the Punjab Chief Minister. CHANDIGARH, Dec 19  The annual sports meet of Strawberry Fields School of the Durga Das Foundation, Sector 24, held today, was a thumping success. The chief guest, Capt Kanwaljit Singh, Punjab Finance Minister, gave Rs 1 lakh to the school. Beginning with a march past by the school captain, who was followed by the vice-captain and three house captains, the programme had little ones jiving and jumping their way right into the hearts of the audience. Divided into two groups, the kids twirled and skipped as one nursery rhyme followed another. Next came children dressed as horses, monkeys, bears, elephants and cats for the animal parade. The kaleidoscopic drill was a splash of colour with balls of various hues to present exercises. The catchy tune of 'Macarena' had the tiny tots swirling and twirling, putting their best foot forward. Aerobics by the nursery class was a visual treat. Races were held for 'snails' and 'jumping Jacks and Jills' and 'elephants', 'horses', 'bears' and 'monkeys' chose to participate too. Students wearing animal masks shot through the race track with enthusiasm. The background music was provided by the Chandigarh Police Brass Band. Later, Capt Kanwaljit Singh lauded the effort of the students and gave away prizes for various events. The Geetanjali Mahajan Award for overall excellence went to Pragun Vinayak and Shiven Bali of lower kindergarten. The curtain came down on the event with the arrival of Santa Claus in the Classic convertible Italian Fiat. He distributed sweets to all those present. 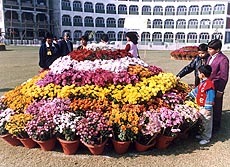 Flower show: A chrysanthemum show was organised on the lawns of St Xavier's School, Sector 44, here on Saturday. As many as 2000 flower lovers visited the school. Varieties of chrysanthemums, including spiders, pompoms, korean buttons and anemones, were the main attractions of the show. The show will remain open tomorrow. A prize distribution function will also be held. Campaign concludes: The week-long awareness campaign against polythene at the Plaza, Sector 17, concluded on Saturday. A rally by 400 students from Hansraj Public School, Panchkula, marked the occasion. They carried banners highlighting the ill-effects of the use of polythene. New association: The ex-students of Yadavindra Public School formed the Old Yadavindrians Association (OYA) at a meeting here at the school on Saturday. Its office-bearers are: President  Mr Kapil Jaspal; Vice-President  Dr Jaspinder Singh Teja; Secretary  Mr Rahul Malhotra; Joint Secretary  Mr Prabhjyot Singh Brar; Treasurer  Mr Ajay Arora; and Press Secretary  Mr Paramvir Singh. Camp begins: A 10-day camp of of NSS volunteers of Government Model Senior Secondary School, Sector 23, began on the school premises here on Saturday. Lectures on the aim and objectives of the NSS will be delivered, poster and slogan writing contests, a trip to historical places around the city on cycles and an athletics meet will be organised during the camp. Till now, the Governor was the accepting authority of only a handful officers like the Home Secretary, the Inspector-General of Police, the Finance Secretary, the Deputy Commissioner and the SSP. This decision will be operative for the ACRs for 1998-99. It will also apply in the case of those ACRs which are pending and relate to previous years. A special sainik sammelan was organised. Col Ajit Singh, Commanding Officer of the unit, greeted all unit personnel and members of their families. He lauded the hard work, discipline, dedication and professional skill of the personnel during war and peace. The military police plays an important role in assisting the Army in the maintenance of high morale, prevention and detection of crime and providing help to all its personnel, the Colonel added. The unit was raised on December 20, 1962, at Ambala and moved to its present location in April, 1984. It also took part in the Indo-Pakistan wars of 1965 and 1971. A variety programme and sports meet for the families of the personnel was organised at the unit complex. The 'bara khana' was attended by a large number of officers, ex-servicemen, civilians and their families in the evening. CHANDIGARH, Dec 19  The Judicial Magistrate, Ms Paramvir Nijjar, today convicted Fateh Singh, a 22-year driver of Jalandhar district, under Sections 279 and 304A of the IPC. Ms Nijjar sentenced the driver to rigorous imprisonment for six months and imposed a fine of Rs 2,000 on him. According to the prosecution, Fateh Singh had knocked down a cyclist, Anita Devi, near Daruha village in the Union Territory killing her on the spot. The defence stand, on the other hand was that the sole eyewitness had failed to identify the accused and thus the driver was entitled to the benefit of the doubt. CHANDIGARH, Dec 19  The Additional Sessions Judge, Mr GS Sandhu, today convicted Pritpal Singh and Prem Singh, two brothers of Maloya colony in the Union Territory, under the narcotics Act. He sentenced them to rigorous imprisonment for 10 years and imposed on them a fine of Rs 1 lakh each. In case of default of fine payment, they were directed to undergo further imprisonment for two years. According to the prosecution, 1 kg charas was seized from the possession of Prem Singh, while 500 gm charas was seized from Pritpal Singh. The prosecution added that SI Jagir Singh, on a tip-off that Prem Singh and Pritpal Singh were bringing charas from outside Chandigarh, apprehended them from near a river. CHANDIGARH, Dec 19  Some political parties at a joint press conference today urged the Chandigarh Administration and the Chandigarh police to have more coordination between themselves as their functioning affected the common citizens the most. The political parties which participated in the conference were the Janata Party, the Samajwadi Party, the Samajwadi Janata Party, the Janata Dal and the Communist Party of India. CHANDIGARH, Dec 19  At separate meetings held at the Senate Hall of Panjab University, deans of the various faculties were elected unopposed, here today. In the Faculty of Education, Dr Satinder Dhillon, Principal of the Dev Samaj College of Education, Sector 36, emerged victorious, while Prof Satya Prakash of the Department of Physics was elected Dean of the Faculty of Science. Dr Deepak Manmohan was elected Dean of the Language faculty. Prof Bidi Chand and Prof R.P.Gupta from University Business School, Panjab University, were elected Dean and Secretary, respectively, from the Faculties of Business Management and Commerce. While Prof Joginder Singh was elected Dean from the Faculty of Design and Fine Arts, Prof Jodh Singh was elected Secretary. The Registrar of Panjab University, Prof Paramjit Singh, was elected Dean from the Faculty of Engineering Technology and Dr Pam Rajput of the Centre for Women's Studies was elected dean from the Arts Faculty. Meanwhile, Principal Tarsem Bahia of AS College, Khanna, has resigned from the Senate of Panjab University. He did not participate in the Syndicate elections held recently. He was elected in September 1996, from the lecturer constituency of the affiliated colleges. CHANDIGARH, Dec 19  A man who attempted to forge papers and get a plot allotted in Sector 44 by becoming a member of a cooperative housing society, has been booked. Chander Prakash of Sector 15 had given a forged affidavit to get allotment of a plot. His wife had already been allotted a flat by the Chandigarh Housing Board. He has been booked under Sections 420, 467 and 471, IPC. The UT Estate Officer had lodged the complaint. Injured: A cyclist, Darshan Singh of SAS Nagar, was hit by a Gypsy (HR-51-A-5242) driven by Narinder Singh near the roundabout of Sectors 24, 25, 37 and 38. The injured was admitted to the PGI. A case has been registered. House burgled: The house of Joginder Singh Gujral in Sector 10 was burgled and jewellery and cash were taken away. The police has registered a case under Section 380, IPC.